Life aboard the International Space Station (ISS) has returned to normal after a late conjunction threat forced the Station’s crew into contingency operations. 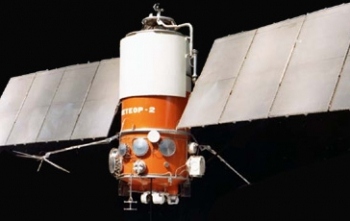 The implementation of Flight Rule B4-101 – resulting in the crew taking up the “safe haven” of a docked Russian Soyuz vehicle – was required during a close pass of debris from an old Russian weather satellite. The threat of space debris is a continuous consideration for all spacefaring vehicles. The ISS has the safety blanket of Space Command/NORAD, which tracks relatively large pieces of debris – usually originating from expended satellite and rocket hardware. Usually, this allows for the Station to receive a heads up and conduct a Pre-Determined Debris Avoidance Maneuver (PDAM) to move the orbital outpost into a different path and thus avoid a potential collision. Rare events are classed as Red Late Conjunctions, where the threat is spotted late – with no time to conduct a PDAM – and is inside a path that has a chance – albeit very small – of hitting the Station. One such incident occurred on March 13, 2009 – when a “RED Late” Conjunction threat resulted in NASA’s Expedition 18 Commander Mike Fincke, Russian Flight Engineer Yury Lonchakov and NASA’s Sandra Magnus being asked to evacuate into the “safe haven” of the docked Soyuz, as the ‘25090 PAM-D’ debris closed in on the Station. The debris passed by the Station at a safe distance, allowing for nominal operations to resume. NASA noted this latest debris threat originated from an old Russian weather satellite, with sources (L2) adding it was “Object 36912” in the US catalog list – debris from a Meteor-2 satellite that was launched on a Vostok-2M rocket in 1979 from the Plesetsk Cosmodrome. Per Flight Rule B4-101, a “late conjunction” call results in the crew being ordered to close the hatches between Station modules and enter the Soyuz vehicles – which serve as lifeboats during their docked stay at the ISS – before TCA (Time of Closest Approach) breaches the 10 minute mark. 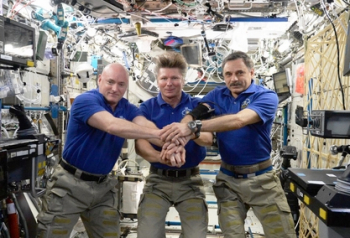 During Thursday’s event, the three members of the Station – Commander Gennady Padalka, Mikhail Kornienko and NASA astronaut Scott Kelly – closed the hatches and took up residency onboard Soyuz TMA-16M. They stayed in the Soyuz for around 10 minutes, according to Roscosmos. Per L2 ISS Status, it was confirmed the event was a Late Conjunction threat. “Late Notice Conjunction: Crew Shelter in Place. This morning the Flight Control Team was notified of a conjunction with insufficient time to execute a Predetermined Debris Avoidance Maneuver (PDAM). The order would be to initiate an emergency departure from the Station, had the debris threat realizes itself into an impact and caused a breach of the life support environment. 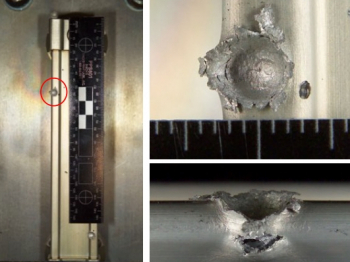 Such larger debris threats do have the capability of puncturing one of the Station’s modules, as was later noted via the 2009 threat of the “yo weight” that was originally part of a Delta PAM-D stage used to launch GPS 37 in 1993. 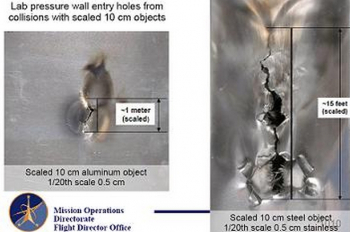 However, the odds of the Station – racing around at 17,500mph – being hit by a major debris strike are extremely small. Also, the ISS does have some protection against the smaller MicroMeteoroid and Orbital Debris (MMOD) strikes. The ISS sports a number of battle scars from such strikes, ranging from impacts to the arrays, windows and handrails – the latter pointed out ahead of EVAs, where the spacewalkers are told to be careful where they put their hands, due to the shape edges that usually surround the impact point. Such sharp edges could cut their EMU gloves, which subsequently threaten the termination of an EVA, such as the scenario that occurred to STS-118 spacewalker Rick Mastracchio, who was sent back to the Quest airlock after a cut was observed in his glove during on routine half-hourly check. The Station’s modules are outfitted with nextel/Kevlar shielding, which has been tested to show it can successfully withstand MMOD strikes. Such examples of testing include ESA’s evaluations into the nextel/Kevlar material used to protect its ATV spacecraft, showing it could protect the vehicle’s hull after test firing a 7.5 mm-diameter aluminium bullet at 7 km/s. 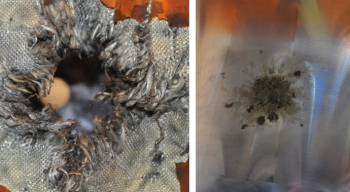 “The stuffing fabric and a surrounding sheet was thoroughly shredded by the impact, but the overall mass and energy of the debris was sufficiently dissipated that it harmlessly scorched the innermost 3-mm-thick aluminium wall,” noted the test results. Thursday’s event is understood to be only the fourth time in ISS history that the Station’s crew have been told to take up the “safe haven” of the docked Soyuz. With the threat passing without incident, the three crewmembers have returned to their duties, which include continued work on maintenance of the troublesome Carbon Dioxide Removal Assembly (CDRA). (Images: Via ESA, NASA, space.skyrocket.de and L2).